The GuidePoint Virtual Security Operations Center (vSOC) was designed to address many of the common complaints and issues customers experience with other managed service providers. We use the cloud to provide dynamic scalability and cost savings. vSOC analysts provide validated security incidents that allow you to focus on what’s really important: remediation. vSOC Detect now integrates with CrowdStrike Falcon by leveraging the Falcon Connect API to ingest Falcon host data in to the vSOC Detect monitoring platform. This integration enables vSOC Detect to leverage the CrowdStrike platform for endpoint monitoring and allows analysts to correlate endpoint data against SIEM security logs. 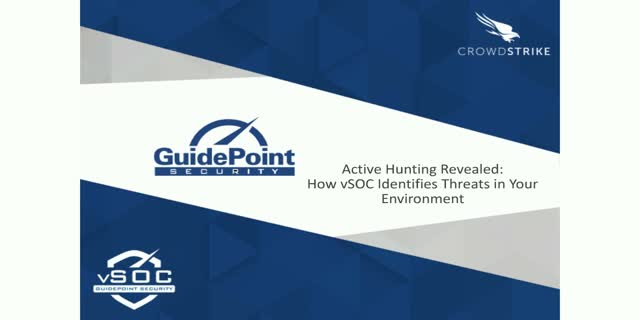 This added correlation within our SIEM enables active hunting by vSOC Detect analysts to discover new and emerging threats in customer environments. Join us to explore “Hunting with CrowdStrike”— and how our Integrations make CrowdStrike Falcon Versatile and Effective. Today’s attackers use advanced techniques and tools to compromise systems and hide among normal activity. Did you know that most successful attacks have gone undiscovered by a logs-only approach? This can lead to theft of sensitive information, disruption of business operations, or destruction of assets and damage to your business’ reputation. Are you an information security professional struggling with labor-intensive and slow-moving incident response processes? According to a recent Enterprise Strategy Group survey, more than 60 percent of information technology professionals say their organization has taken steps to automate incident response, but 91 percent say the processes are not very effective or efficient. The problem? Information security teams are limited by time and have too many manual processes. When the PCI SSC published version 3.0 of the PCI DSS, they revised their complement of Self-Assessment Questionnaires (SAQs) to align with the new standard. Part of the release included three new SAQs that reflect their maturing perspective on the threat landscape and the appropriate measures needed to safeguard customers’ cardholder data. Most organizations realize it’s no longer a matter of ‘If’ their organization will be breached but ‘When’ (if it hasn’t already happened and they just don’t know it). The key question is ‘How can you gain better visibility, sooner to the signs that your organization is under attack and respond quickly?’ In this webinar we will examine critical dynamics in the cyber threat landscape. We’ll also discuss how integrating security intelligence with a new and more efficient organizational approach to responding to cyber-attacks can enable organizations to detect and respond to these threats faster and with greater precision than ever before. Come join the interactive conversation about factors CISOs should be considering when implementing a mobile security solution. The mobile landscape is changing rapidly, creating new challenges and opportunities for CISOs tasked with balancing business enablement and risk. The popularity of BYOD and employee use of mobile apps (whether sanctioned and not) has catapulted mobile security to the top of the priority list. The explosion of data outside the four walls of the company raises questions CISOs should be asking to understand how to craft their mobile security strategy and the importance of a data centric approach to protecting sensitive information from unauthorized access or abuse. Come join the conversation on the pros and cons of commercial and open source options available in AWS, best practices for managing logs and monitoring incidents in the Cloud, and guidance on what to log from two security leaders in the field.